Commit to change what you drink for two weeks. Free up at least $23. Provide clean, safe water for one person. 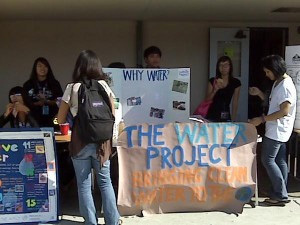 The Water Challenge is a unique fundraiser for groups of all types and sizes. With our ready-to-go toolkit, hosting your own Water Challenge is simple and fun. 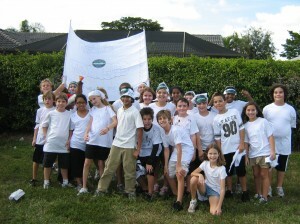 Looking for a way get your school, church, youth group or company involved? Not sure just another fundraiser is going to cut it? Is everyone you know a bit "tapped out"? We've got a unique way to raise money for water projects that answers these problems. And it really works! It doesn't require anyone to stretch their budget. Instead... it's a simple trade. Give up one expense for two weeks. Donate what you save ($0 out of pocket). Drink water to give water. Drinking only water for two weeks can free up at least enough cash to give one person access to water. Don't believe it, check our math! Two Weeks will change a community, and how you see the world, forever. can unlock the potential of an entire community in need of clean, safe water! 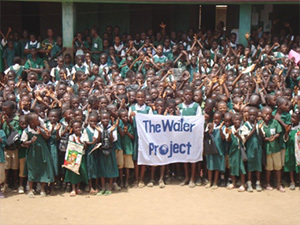 Over the last 12 months, over 800 groups all around the U.S and Canada signed up for "The Water Challenge" to fund water projects at schools and community centers in Africa. The water projects they funded are being built right now! And these groups are watching it all happen online. Now...it's your turn! Sign up right now to find out how to get your school, youth group, church, office or friends involved to help give clean water. We'll get you everything you need. Super Simple. Show that you're each committed to help at least one person get water and get a free wristband. It'll help you remember to choose water and to spread the word too. Take the money you would have spent on soda, juice, sports drinks, bottled water etc., and put it aside to give clean water. After 2 weeks, calculate the amount of money saved by your sacrifice and give water through your team fundraising page. 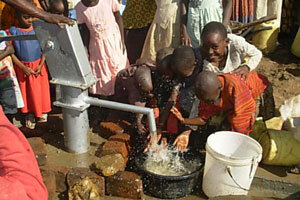 It will be used to fund a new water project in Burkina Faso, Kenya, Sierra Leone or Uganda! Within about 8-12 months of your donations, you'll be able to see the project you helped build! We'll post pictures, GPS coordinates, and brief community reports right from the field as soon as the project gets started. See the work we're doing right now to get an idea of what you'll see too! 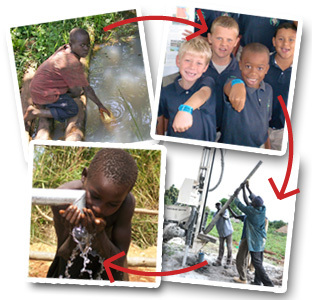 It's easy to launch your own "The Water Challenge" fundraiser and help provide access to clean, safe water! Organizing things is a snap. Everything you need to get started is provided in our free toolkit. Learning tools, video, posters, scripts, forms and more are all included free. It's easy to use so you can concentrate on making your fundraising challenge a success. Grab the free kit. You don't have to commit to anything just yet. You can decide when and if you want to participate after looking it over. 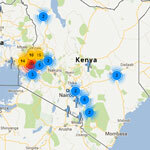 Join the hundreds of schools, churches, youth groups and even companies helping those in need of water! We're always amazed by our supporters! Last year we sent out 1,000s of participant bracelets. Together we brought clean water to tens of thousands of people. We've featured some of the groups who've recently completed the challenge on our site - so you can get inspired. 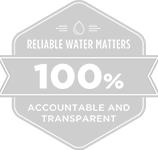 We'll help you think through your project and get you any additional resources you need. Don't hesitate to contact us and ask!